Registered: your name will appear on the list of those planning to attend a session. Ineligible: you do not meet the criteria needed to be provincially funded for the session. Withdrawn: you were registered but have removed your name from the registration list. Pending: a request to the local executive results from your registration steps and the local executive officers review the request; Approved completes the registration and Rejected stops the registration process. The Executive Board of UNA has established a set of guidelines for Provincial workshops that will assist in helping you determine which sessions you might attend or explain why you are ineligible for a particular event. Local events are controlled completely by the Local. All provincial sessions have a restriction of 5 members from a given local in order to provide the option to as many locals as possible. If you have exceptional circumstances that might override the provincial regulations outlined, contact your Local Executive for assistance. If it is felt that you would benefit from the session a request for special consideration will be sent via email to Karen Craik. The Events options provide the tools to register/withdraw for events created and hosted by the local and those offered by UNA. Until the local begins to use the DMS to setup registration for locally sponsored events, there is no Local Events data to display. Selecting the Events tab produces the default display of Current Registrations with the option of moving to Available Events or Past Attendance. 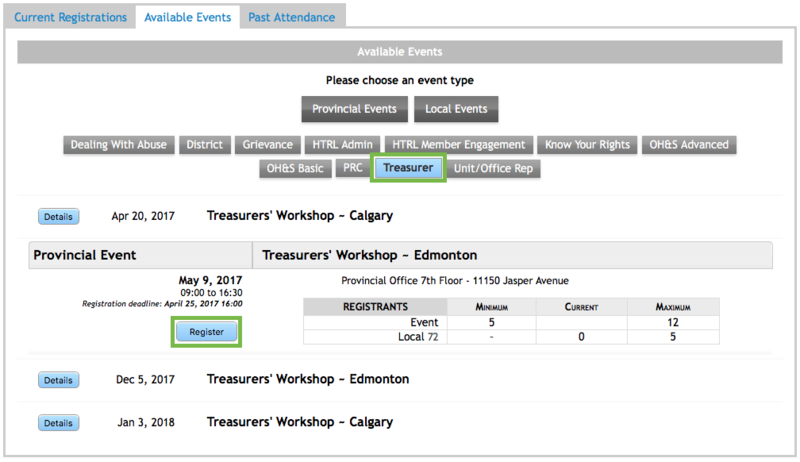 From the Events tab, select Available Events and click on Provincial Events. 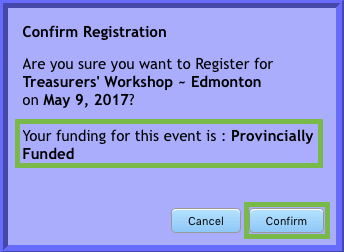 The list of upcoming Provincial events is usually extensive and to save time you might want to click the button for a particular workshop. When viewing the list of Available Events, keep in mind that you do not qualify for provincial funding for every workshop provided by UNA Educators. Locate the session that interests you, being aware that you must register in a session closest to your home. Also, note that if the local already has 5 members registered for a given session you will not be able to sign up. From the available options, click the Treasurer to obtain a list of the upcoming sessions. Always select the session that is located nearest your home. Click on the Register to proceed. The system will display a Confirm Registration message and the information that you are Provincially Funded. Clicking Cancel stops the process. Clicking Confirm continues the registration process. The system will run a check to ensure you are eligible to attend the session. 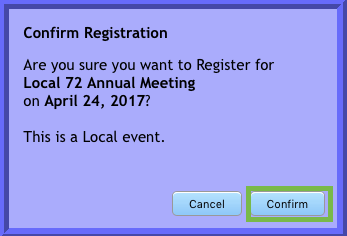 Registered will show up by the event indicating you are on the registration list. Click the Available Events tab and select Local Events. After the Local Executive enters events into DMS, you can register yourself. Click on Register for the event you want to attend. A confirmation screen will appear: click Confirm. You are now registered for the event. It may become necessary to remove your name from the registration list. The default display in Events is the Current Registrations table. This table shows your personal registration status for both Local and Provincial events. Locate the appropriate workshop and click the Withdraw button. 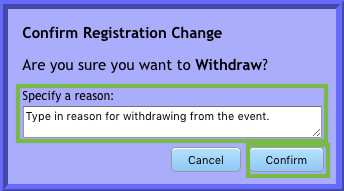 A confirmation screen will appear: enter your reason for not attending, and click Confirm. When the table refreshes, the list shows the Withdrawn status. There is the ability to Re-Register for the event. Just click on Re-Register and you will be back on the registration list.